Imagine yourself on a lazy Saturday afternoon. You finally have the time to try your hand at Lebanese cuisine. So you go on Google and search for “Lebanese recipes”. You get a list of lists. For the next 30 minutes you go to each of the links, read through their recipe recommendations, come back, click on the next one and repeat – until you realize that you’re too tired and would rather just order in.This is where Google’s Rich Cards can help you out. One of Google’s biggest visual updates for search results in mobile devices this year, rich cards can offer you recipes and movie recommendations from each link right in your results page, along with images and additional info. Rich cards on a mobile browser appear as carousels that can be scrolled easily as they are laid out horizontally. 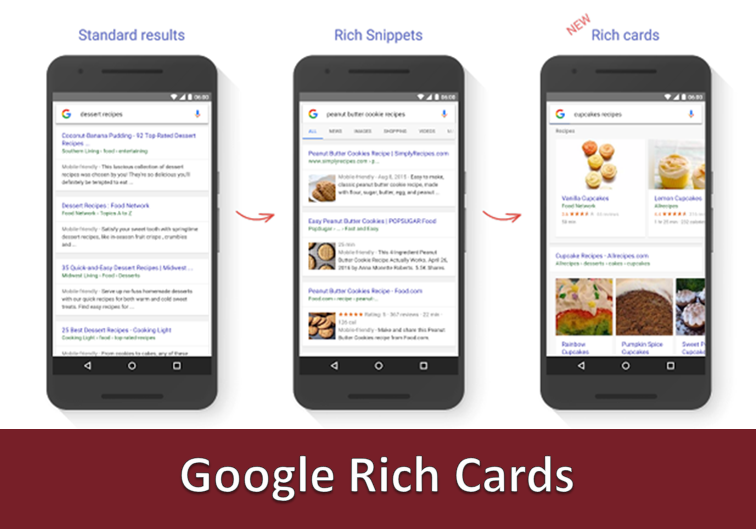 Built from Google’s list schema algorithm, rich cards can also be paired with rich snippets to offer visually attractive and informative results. For example, rich cards can carry information about each recipe’s preparation time, the combined calorie content and much more. Rich cards are one of the first major implementations of Google’s recent changes to its search presentation that places great importance on the “user’s intent”. This means that Google tries to understand and then act upon the user’s intent, by changing the visual representation of the results. Therefore, the same results might be presented in different queries from different users, in different ways. The rise of rich cards are a shot in the arm for mobile users for whom a scenario like the one above would involve the most effort. This follows on the heels of recent trends seen in internet technology, where companies, online brands, website owners and search engines visualize a future where mobile comes first, and are therefore trying to offer an experience that is more user-friendly and visually appealing on mobile devices. Google now presents all search results in mobile devices, even the ones without rich elements, in the form of cards. This is the result of Google’s recent philosophy of visualizing individual search elements as fundamental units that are presented visually as cards. Rich Cards are built upon this and present more information to the user at first sight. Rich Cards can prove heaven-sent for companies trying to attract customers through search engines. Websites that implement rich cards and rich snippets have greater advantage of standing out in a user’s search results, presenting a more attractive, informative and trustworthy option among all the other links in the search results. If you are an individual or a business looking to better attract and engage with your clients online using powerful and effective SEO techniques like rich cards, we, at Global Media Insight, can help you out. With over 16 years of experience in digital technologies and social and digital markets, we excel at driving engagement by optimizing your business’s online appeal, reachability and connections. Get in touch with GMI to establish effective and robust digital marketing strategies that span platforms and channels. Google Panda 4.0 Update- Will it affect your business in Dubai?